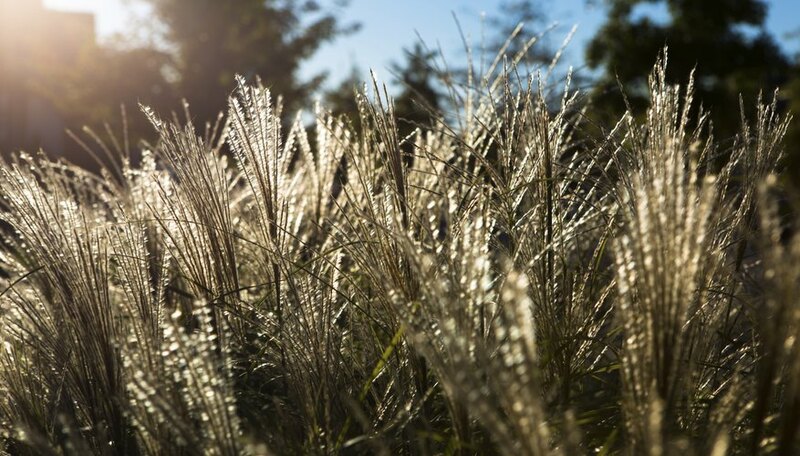 With its striped foliage and feathery, copper-colored seed heads, zebra grass (Miscanthus sinensis "Zebrinus") adds year-round beauty to yards in U.S. Department of Agriculture plant hardiness zones 4 through 9. It is a relatively low-maintenance plant that will withstand drought, heat and wet soil once established in a sunny or partly shaded bed. Zebra grass will look better and live a longer, healthier life if you give it proper care. Although drought-tolerant, zebra grass performs best when grown in moist soil. Provide 1 inch of water weekly during the growing season in climates with long, hot summers. In mild climates, provide water only during periods of prolonged heat or drought. Don't water in winter because it can lead to root rot and other bacterial. Container-grown zebra grass requires more frequent watering due to its limited soil capacity. Water container-grown zebra grass daily if temperatures rise above 85 degrees Fahrenheit, adding water until it flows freely from the pot. Otherwise, water whenever the soil feels dry below the surface. Plant zebra grass only in containers that have drainage holes. Zebra grass seldom needs supplemental fertilizer and will thrive in nutrient-poor soil for years. Excess nutrients cause weak, spindly growth that may need staking, so fertilizer should not be regularly added to the soil. One exception is if the plant shows signs of poor growth or nutrient deficiencies such as sparse or yellowed foliage. If you notice symptoms, fertilize the zebra grass in early spring with granular, 10-10-10 ratio fertilizer. Sprinkle 1/4 cup of fertilizer onto wet soil around the base of each plant, or feed larger plantings at a rate of 1/2 pound per 100 square feet. Zebra grass reaches a mature height of 5 to 8 feet with an upright, 4- to 6-foot spread. Its tidy growth habit and striking foliage needs no pruning during the active growing season, but it should be sheared back once a year to make room for fresh, new growth. In late winter or early spring, prune back the entire plant to between 4 to 6 inches tall. Soak your shears in full-strength household disinfectant for roughly five minutes, rinse them in hot water and blot them dry before use. Disinfecting pruning tools helps reduce the spread of pathogens. Even healthy, well cared-for zebra grass will eventually decline with age. The oldest part of the plant often dies out, creating a bald spot in the center of the clump. Dividing zebra grass every three to four years will keep it looking healthy and attractive. Autumn division works best in mild climates, while spring division is best in colder climates with prolonged frost or snow. Dig up the entire plant and cut it into sections, each with a share of roots and foliage. Discard the old, dead center and transplant the sections 3 to 4 feet apart. Serious insect and disease issues seldom afflict established zebra grass, but it's not without its faults. Its tall, canelike foliage sometimes falls over, especially when overfed, shaded or covered with snow. Staking may be necessary if the problem doesn't correct itself after heavy pruning. Another problem with zebra grass is its sharp, razorlike foliage, which can cause cuts. Wear gloves and long sleeves when working with zebra grass and plant it away from walkways and other areas where people might brush past it. In warmer climates, zebra grass may escape cultivation and become invasive. Growing it in a container or installing root barriers to stop its spread will help quash its aggressive tendencies and keep it compact and tidy. North Carolina State University Cooperative Extension Service: Miscanthus Sinensis "Zebrinus"
Mahoney's Garden Center: Miscanthus Sinensis "Zebrinus"
University of Florida IFAS Extension: Miscanthus Sinensis "Zebrinus"